In 2018, news outlets reported that a man was working on a construction site in Lower Township when he got hit in the head and fell off scaffolding. Though emergency crews responded, they pronounced the man dead at the scene. This is only one example of fatalities and serious injuries that resulted from accidents involving scaffolding in New Jersey last year. Scaffolding on buildings is a common sight for New Jersians, as scaffolding is an integral part of many construction projects. These temporary structures allow construction workers to reach high parts of buildings for repairs, improvement, or new builds. On the other side of the Hudson, you can find scaffolding on nearly every block. Every time you see scaffolding, however, you are also witnessing the risk of a serious scaffolding accident. Behind only transportation, construction is the second-most dangerous industry in New Jersey. However, it is a necessary industry and many people earn a good living working on construction sites. This type of work can put you in many types of potentially dangerous situations, including working in high places such as scaffolding, from which you may fall. All of the above injuries require emergency medical treatment, and many can be fatal. After a scaffolding accident, an injured worker may incur thousands of dollars (or more) in medical bills, may lose substantial income from missing work, and may experience significant pain and suffering. In many cases, the employer’s workers’ compensation insurance will provide benefits to cover medical expenses and part of the victim’s lost wages. However, this compensation is often insufficient to cover all of the accident victim’s losses. It is important to seek help from a lawyer who can determine whether a third party was also at fault for the scaffolding accident. For example, if a driver crashed into the scaffolding and caused a collapse, that driver should be liable for any injuries and losses that resulted. Other parties may include third-party contractors involved, the scaffolding manufacturer, and more. 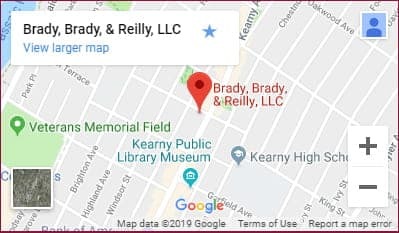 At Brady, Brady & Reilly, LLC, we are ready to help after a serious construction accident. We represent injured accident victims and work to ensure they receive the maximum amount of compensation they deserve. Contact us online or call 201-997-0030 to schedule your free case evaluation.